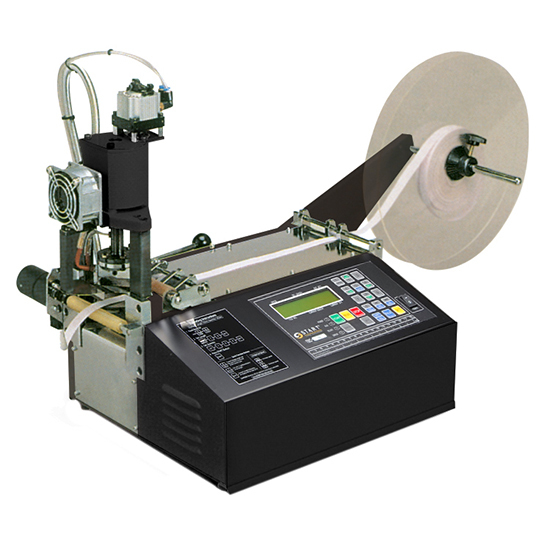 The START International TBC50-HX Heavy-Duty Non-Adhesive Material HOT Cutter with Angled Knife automatically dispenses, measures, cuts, and heat seals non-adhesive materials prone to fraying. It's ideal for heavy production to cut ribbon, belting, webbing, sleeving, strapping, rope, etc. The TBC50H cuts up to (Straight 1.77" - 45 mm - oblique 1.18" - 30mm) wide material or multiple rolls. The built-in high speed operation cuts up to 140 pieces per minute at 2" (50mm) in length.